I know that sounds like a ridiculous question to guys like you and me, but really. Despite the success of Jobu’s Rum, I could never eat that much money. I’m only rich in good looks, talent and wit. The Yankees, on the other hand, are money rich. They are a franchise probably worth a couple of billion dollars (if you compare them to the Dodgers). They can afford to give away $150MM for nothing in return. So when will they finally have enough of Alex Rodriguez and send him packing? Why am I all of a sudden on this release A-Rod bandwagon? Yesterday, Alex found himself a doctor that went on the radio and said that the maligned slugger basically didn’t have the quad strain that the Yankees are saying he has. Now, the collective bargaining agreement states that players can seek second opinions on things, but they have to clear it with their team first. Of course, Alex didn’t do this. Anyway, the doctor admitted to not having examined A-Rod, but looked at an MRI result and made his decision. The doctor later backtracked a bit and said that he never said A-Rod was cleared to play (after all, there was no examination) either, but it was too late. The controversy hit the press and sprouted wings. So who is lying? Assuming the Dr. in question is a real professional, and not Dr. Nick Riviera (Hi, everybody! ), it’s probably not the doc. Plus, he backtracked, remember? Is Alex falsely accusing the Yankees of purposefully holding him back with a fake injury? Are the Yankees trying to keep Alex away from the field as long as possible to recoup insurance money and avoid the public relations nightmare that will be his “comeback”? Believe it or not, I think A-Rod is the one technically being wronged here. I don’t think he’s hurt badly enough to remain on the DL. I think the Yankees just don’t want to deal with him right now, and are hoping his suspension comes down within the next couple of weeks. That being said, screw A-Rod. He deserves whatever negativity he encounters in his professional life (I don’t wish personal harm on anyone). I mean seriously. Here’s a guy that deserves to get fired, right? He’s spent the better part of the last five years lying to everyone about his steroid use. Well, he came clean a few years back, but only about the stuff he had been outed on. He then continued to use performance enhancers and got caught again. He has since then twice called out his team for lying about his medical condition, and is facing a giant suspension from Major League Baseball. There’s no way in hell he’s going to be able to come back to the team without being a major distraction to everyone around him. It’s as if he’s completely delusional and thinks he’s just coming back from the DL and nothing else, isn’t it? The Yankees, on the other hand, might desperately need a big bat, but how much are they willing to sacrifice to get it? I I don’t have to deal with Alex, I’d rather they trade some prospects and pay a couple million bucks for Alfonso Soriano. in fact, as long as they pay Soriano less than $147MM, I’d call the trade better than bringing back Rodriguez (note to Brian Cashman… please don’t pay Soriano $146MM). I do feel, however, that the Yankees are wrong in this case. 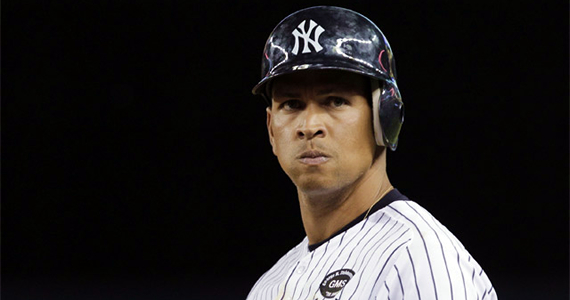 If they don’t want A-Rod back, for whatever reason, they need to cut him loose. If they’re keeping him “injured” to save luxury tax money and avoid a headache “this big,” that’s wrong too. Either let him come back or cut him loose. I really think they’re waiting for his suspension madness to come to an end. It is my understanding that teams aren’t on the hook for money owed to a player while he is suspended. I think the Yankees would like MLB’s ruling to come down so that they can keep Alex on the “payroll” for as long as possible. If he gets 150 games, that’s 150 games they don’t have to pay him for. That’s gotta be close to like $30MM, no? I predict that, unless he really starts going out of his way to disrupt everything (more than he already is), the Yankees will hold onto A-Rod until the end of whatever suspension he gets, and then cut him loose. Why eat $150MM when you can eat $120, right? The only problem is that this suspension probably won’t come any time soon. Alex has allegedly hired the same attorney that exonerated fellow scumbag Ryan Braun the first time (where was that guy this time around? ), which would indicate that he’s settling in for a fight. It could be months before this is settled. It’s actually pretty typical of Alex to desperately try to hang onto his delusions of a legacy, but even he has to realize it’s all over… right? He’s never getting into any Hall of Fame, and he’s lucky if he ever plays real professional baseball again (the Long Island Ducks don’t count). Anyway, I’m done ranting, and I look forward to the day we never have to deal with A-Rod again… whether it’s in 2013 or 2018. 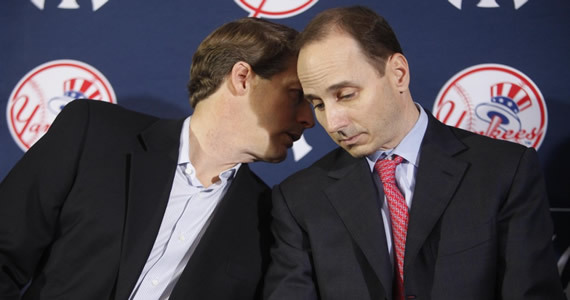 Save us, Bud Selig and Brian Cashman!